I remember how I thought about the sun 20 years ago. We’d go out and bask in it for hours on end… just soaking up the rays. Sometimes we’d rub oil on ourselves first to ensure a serious browning. Suncreen for dogs wasn’t even on the horizon. But now that great solar beauty cooks me to a crisp quicker than you can say ALOE VERA! And don’t let the fur fool you. Some dogs are just as sensitive to the sun as we are. Today we’re talking Canine Sun Safety. When is it needed? Got a dog with a light coloured coat, light skin or a thin coat? Sunscreen your critter. Staffies, Bull Terriers, GSPs and Pit Bulls, for example, are notorious for sun sensitivity. Dogs with a light coloured skin or noses are similarly vulnerable. Watch those white ear tips too! Out for a quick walk at 4? Not a big worry. But if you’ll be exposed for a few hours between 10 – 2 it’s a good idea to play it safe. Dogs can develop uncomfortable burns and skin cancers just like us. *Aniwell Filtabac Sunscreen: SPF 29-33 (blocks around 97% of UV Rays). This one is a full sunscreen as well as an antibacterial cream which will act as a second skin to cover and repair skin from sunburn, wounds or allergies. Very handy! Comes in a 120g tube or a 500g tub for extra value. 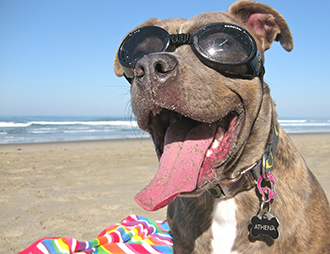 *Doggles Pet Sunscreen: SPF 15 (blocks 93% of UV Rays) It’s non-toxic, non-oily, non-irritating + water soluble. 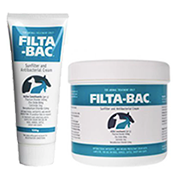 It’s very convenient as you can just spray on coat or skin, but it’s a small bottle, so if you’ve got a big dog you’re best to go the large size Filtabac. 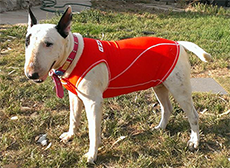 If your dog is very sun sensitive try using a Rashie as a cover up when you are in high UV circumstances. TYou can cover your dog’s back and underside with the rashie and then supplement with cream in the areas left exposed. Can definitely save you some time. *EzyDog Rashie is 50+ SPF (blocks more than 98% of UV Rays). 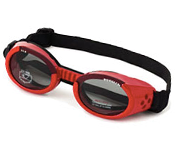 Great for the beach, this Rashie can provide high visibility in the water. Quick dry, odour resistent and easy to wash.
*Surf Dog Australia Furguard Dog Rasher: Manufactured by a well known human rashguard company, using the same protective lycra, SurfDog Australia designed the dog rasher to fit snuggly around your best mate. UV rays impact your dog’s eyes. Mostly dogs don’t complain. But often dogs who get the opportunity to wear Dog Sunglasses associate wearing them with greater comfort in the sun – and they are happy to have them put on. Surprised? *Doggles Dog Sunglasses have 100% UV absorption. Doggles are shatterproof and provide protection from wind and debris. Great for dogs who ride on motorbikes or in cars with windows open. A strap behind the ears and one beneath the chin keeps them snugly in place. 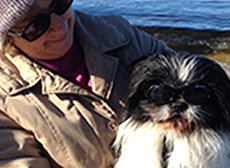 If your dog has a chronic eye condition such as an eye ulcer, pannus, or persistent conjunctivitis, avoiding direct sunlight though the use of Doggles is highly recommended. We’ve all hopped ungracefully across too hot surfaces before. Your dogs aren’t immune to that painful burning sand either, although usually they handle it with less drama and more dignity. : ) Use Mushers Secret Wax to keep paws protected on hot surfaces like beach sand and bitumen. Originally developed for dog sled teams in northern Canada, Mushers Secret Wax is a magical product. You rub it onto your dog’s pads and it absorbs rapidly into the skin and creates a barrier to protect them. Dry, cracked pads become soft again. *Mushers Secret Wax created from 100% safe & natural waxes, Musher’s Secret doesn’t stain carpets. Non-toxic and easy to use, the semi-permeable shield absorbs right into the paws, allowing perspiration to escape through your dog’s toes. 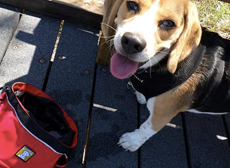 November 13, 2015 | Filed under Canine Health, Living With Dogs, Uncategorized.